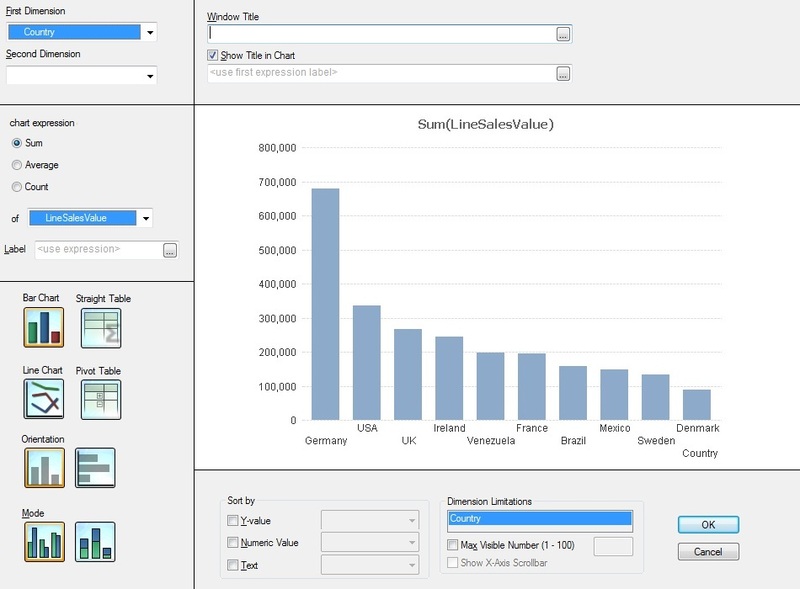 Qlik Tips: Is it time to replace the Quick Chart Wizard? Is it time to replace the Quick Chart Wizard? I have been contemplating the Quick Chart Wizard in QlikView recently. 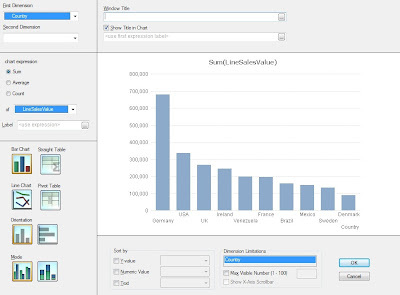 Creating charts in QlikView is very easy once you have a reasonably good grasp of the properties and where everything is. However, for "business" users, this is not always simple. Enter the Quick Chart Wizard. My experience, however, is that the output of the Quick Chart Wizard is almost never an immediately usable chart - you almost always have to then go into the properties to clean it up. There are, I believe, only a couple of options that need to be set in the Wizard to make it produce immediately usable charts almost all the time. And while we are at it, why not do away with a "Wizard" at all and just have everything visible on one page with a preview of what you are building. Dimensions - only 2 (instead of 3 in current Wizard). Vast majority of charts will have 1 dimension. 3 is a rarer requirement so remove from Quick Wizard. Expression - Only one option (as per current Wizard). Added option to label the expression. Titles - not available in current Wizard but something that users will almost always want to change. Sort by: I never create a Bar chart that I don't specify a sort order on, so this should be available as an option. Dimension Limitations: With bar charts, this is something that I probably do more often than not. Preview Window: Show the user exactly what they are building as they are building it. I am really interested in all opinions on this. Does anyone think that the existing Wizard has value? Join the discussion on QlikCommunity. I never use Wizard. One expression in ridicolous.